With a change in elevation of 863 meters (2831 ft) over 20.2 km (12.6 mi), running between the end of a fjord and a small mountain town, Norway’s Flåmsbana makes for one scenic ride. The track passes multiple waterfalls, goes through 20 tunnels, across one bridge, and is doubled in only one spot so that trains traveling in opposite directions can pass one another. The rest of the way, there’s only one track. 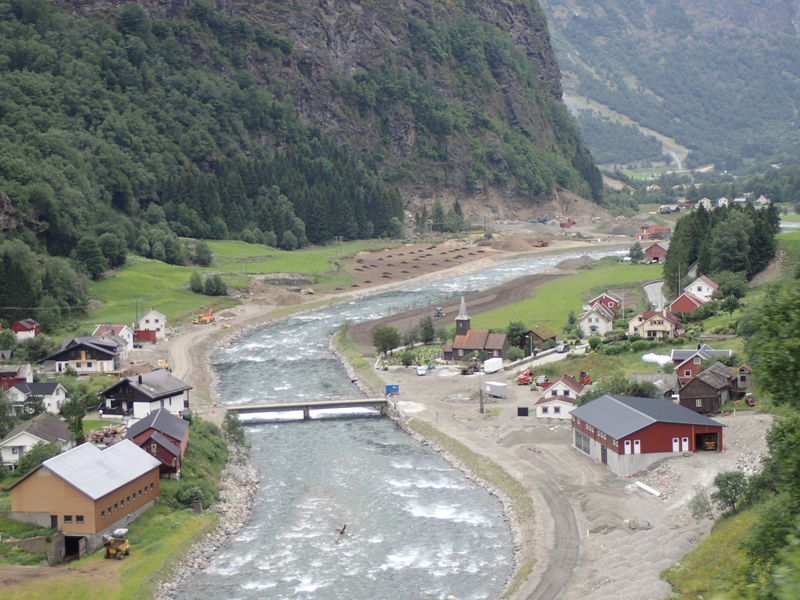 Often considered one of the most beautiful train journeys in the world, the Flåmsbana runs between the mountain station of Myrdal and the fjord village of Flåm. In summer months, Flåm fills with passengers coming through on buses and boats to get a peek at Norway’s incredible fjords. But only 450 people live there year round. Multiple hiking paths set out from town and were I to return to this part of the world, I’d want time to stay in the area and explore on foot. 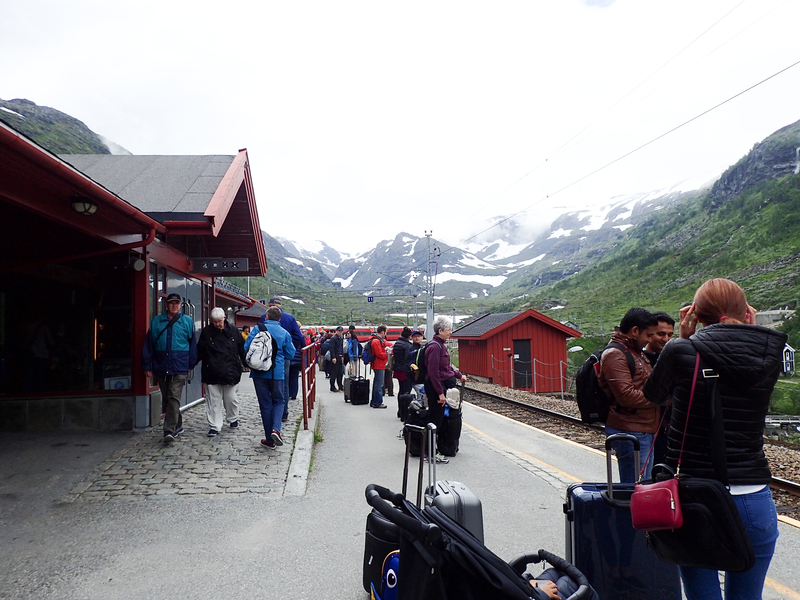 As it was, we traveled by train from Oslo to Myrdal, walked across the platform to catch the train to Flåm, had a few hours to pick up lunch, then boarded a boat for Balestrand. 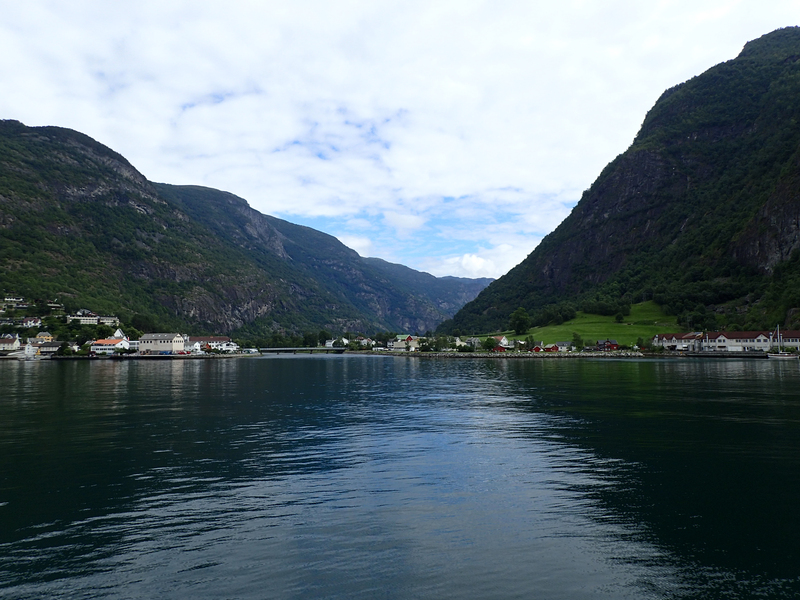 Instead of heading to Balestrand, we could have joined the crowds following a “Norway in a Nutshell” itinerary and gone on to Bergen via boat, bus, and another train. Even though we skipped UNESCO-listed Nærøyfjord, we did make it to Bergen a few days later and saw plenty of beautiful scenery. 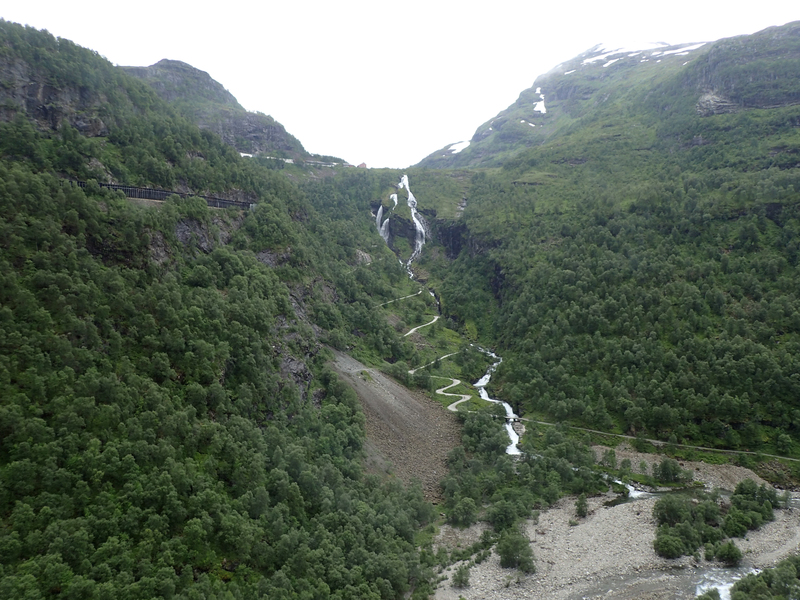 One of the highlights of the Flåmsbana is the brief stop at Kjosfossen, where the train stops just long enough to alight, take a few quick photos, and scramble back to the train along the slippery platform. During the peak summer season, a woman is paid to stand by the waterfall and dance as a huldra, a seductive forest creature found in Norwegian folklore. In the video below, you’ll hear a bit of the music she “sings” before it cuts to footage taken out the window of the moving train. Seats are not assigned and, at least during high season, staff tries to collect large pieces of luggage for storage in a non-passenger compartment but not everyone complies. Carry-on size luggage fits on overhead racks within the train but those big suitcases just wind up blocking access to some of the windows. If you’re planning to take the Flåmsbana and are traveling with large luggage, please follow staff instructions and allow it to be checked. 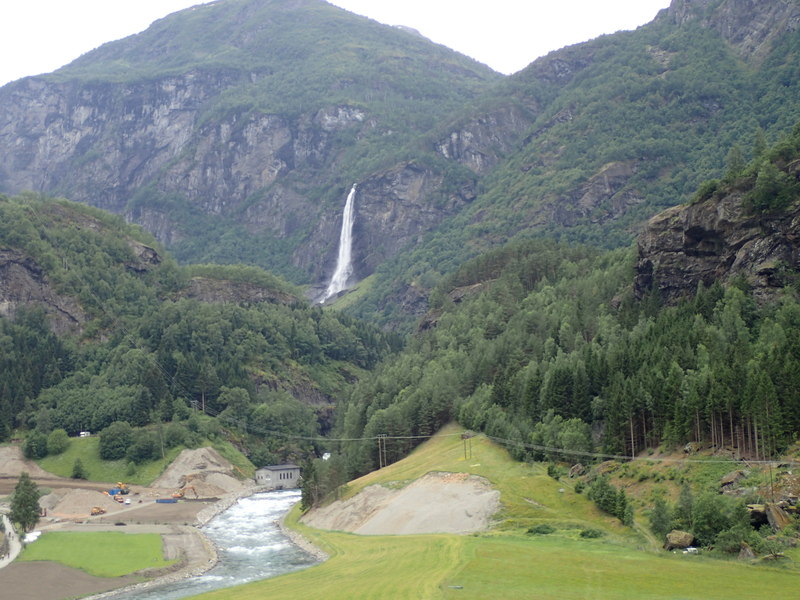 I think this is Kårdalfossen (Kårdal waterfall); note the multiple levels of train track on the left! 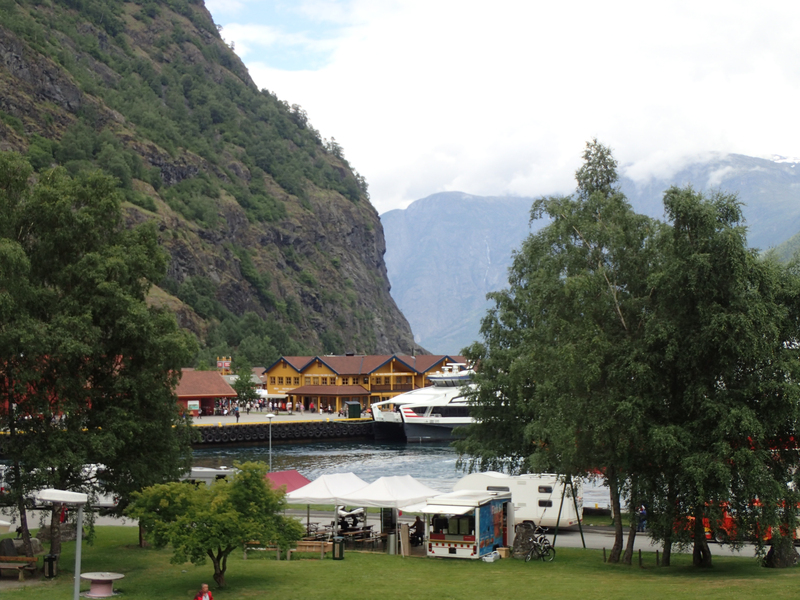 From Flåm, we headed out into the Sognefjord, the world’s longest fjord, of which the Aurlandsfjord is one arm. The boat picked up some serious speed and standing on the bow became a cold and windy affair. Worth it for views like these, though! 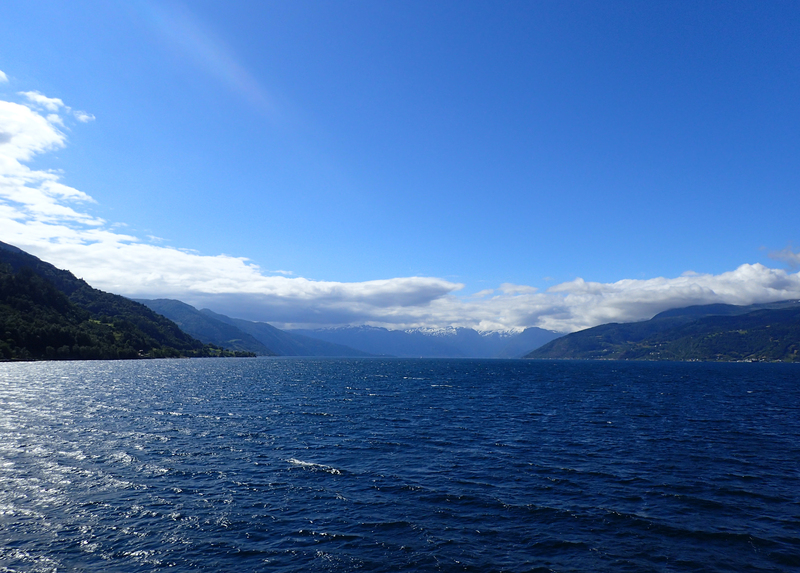 Leaving the Aurlandsfjorden on the water reveals this sight within minutes of a boat departing Flåm. 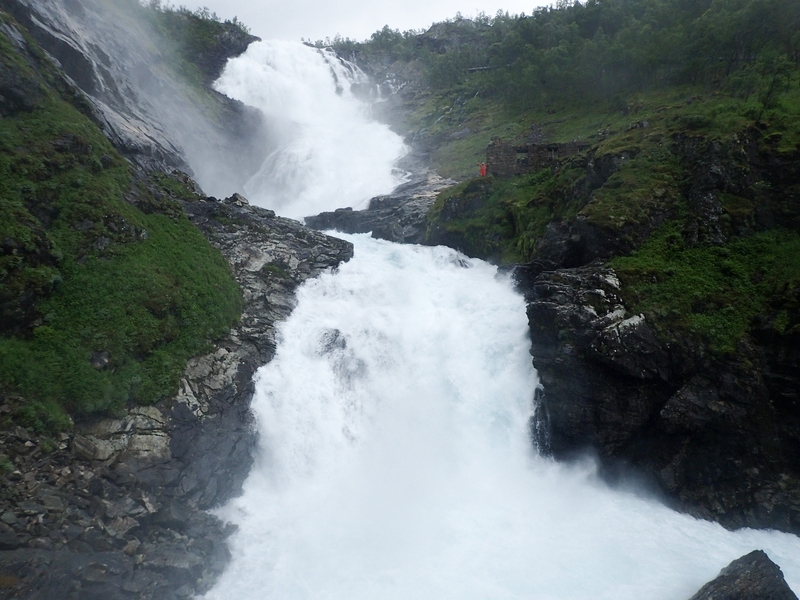 A ride on the Flåmsbana takes about an hour and is a lovely way to see some of Norway’s mountainous region. As you can tell from the photos above, it was a cloudy and sometimes rainy day when we rode the train but sunny by the time we hit the water. 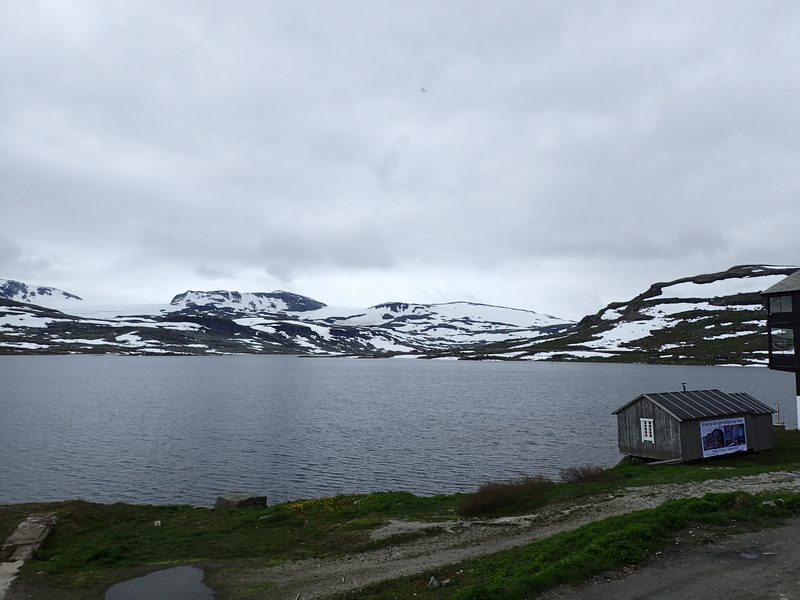 Even with cloudy skies, I can’t deny that the ride from Oslo to Flåm via Myrdal was one of the most beautiful rail journeys I’ve taken. Australia’s Indian Pacific is also up there, although that’s a very different type of beauty!